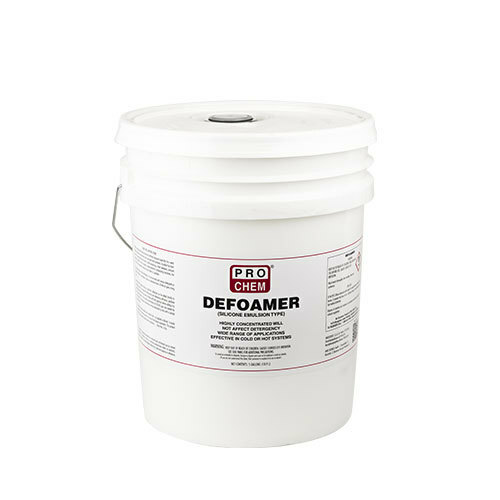 Defoamer | Pro Chem, Inc.
DEFOAMER is a highly concentrated, silicone emulsion antifoam designed especially for a wide range of industrial, institutional, and municipal applications. The fine silicone particles rapidly eliminate and prevent foam. It works equally well in all water temperatures. It is gentle on equipment because of its built-in corrosion inhibitors. It has been designed to reduce foam build-up in wet vacuum recovery tanks and all foam generating equipment. DEFOAMER reduces strain on motors and it lowers labor costs by eliminating the need to continuously empty the recovery tank. With gentle stirring or agitation, Defoamer can be added directly to foaming system. For maximum antifoaming and defoaming efficiency, predilute Defoamer with three to five parts of water with mild agitation before adding it to the foaming system. Only small concentrations of 20-200 ppm are needed for most systems. The proper concentration can be estimated by tests with a sample of the foamer. This product is water soluble and in either form – as supplied or diluted – is easily dispersed in the foaming system or in one of the foamer ingredients. This product will not cause spotting under normal conditions.